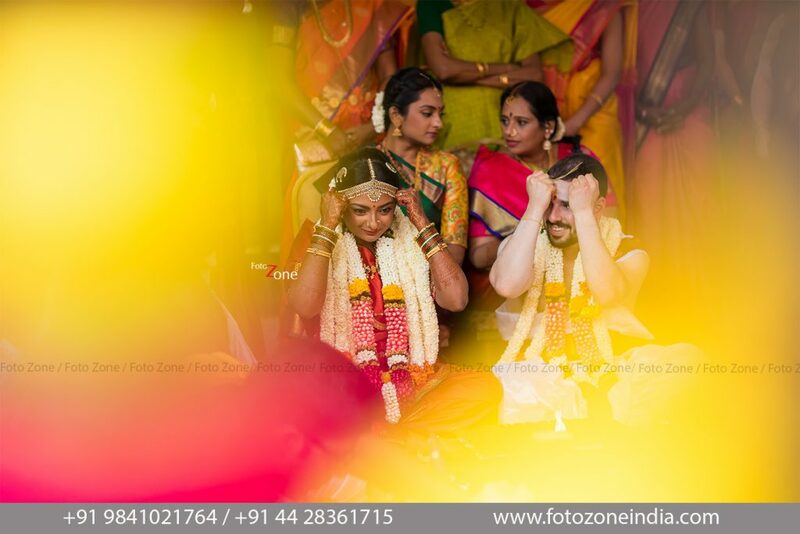 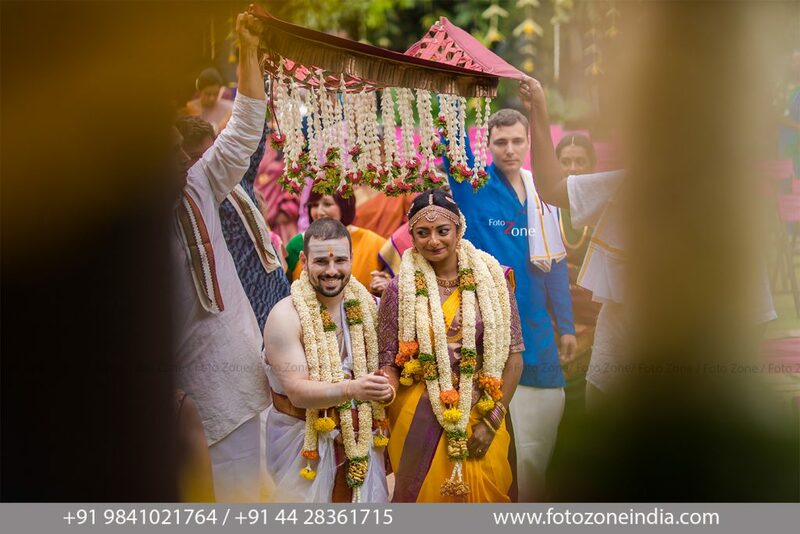 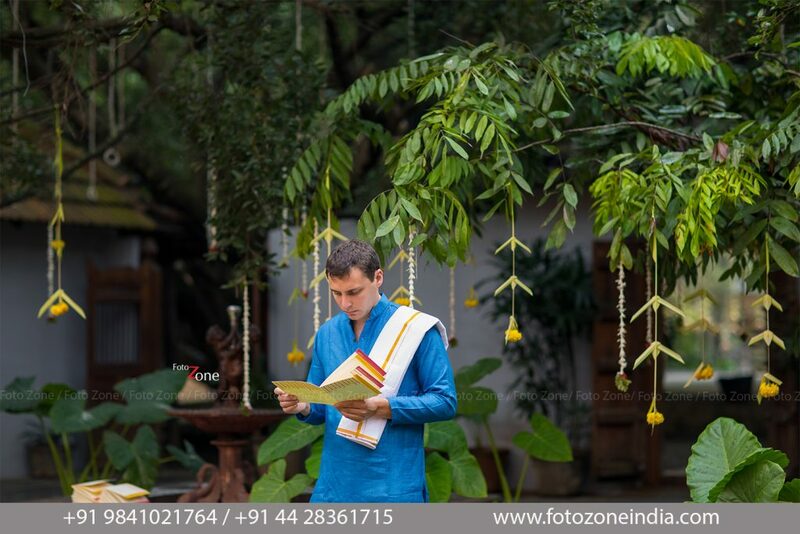 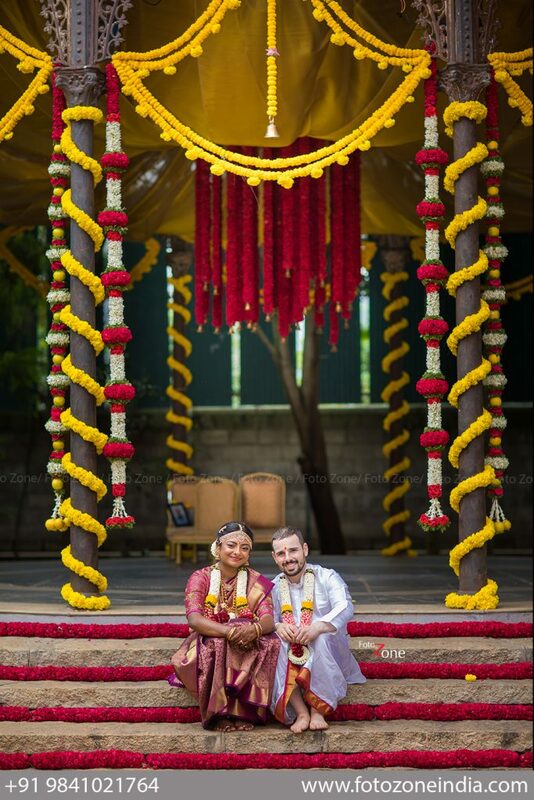 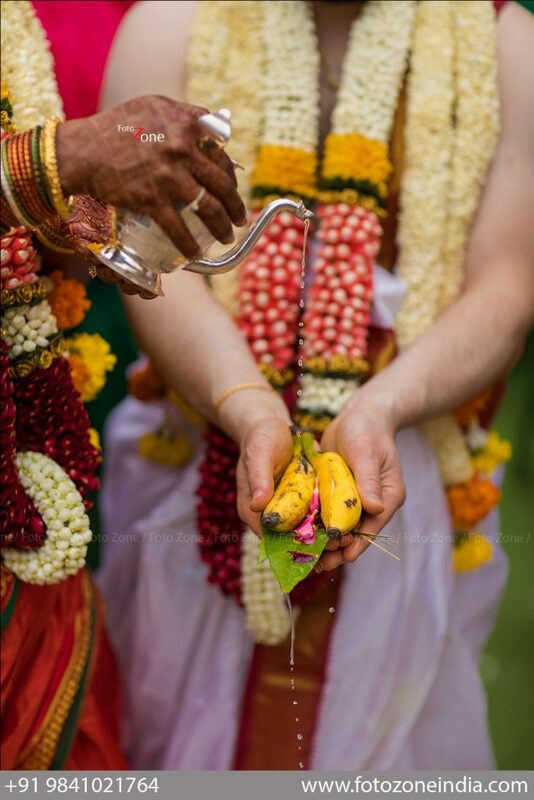 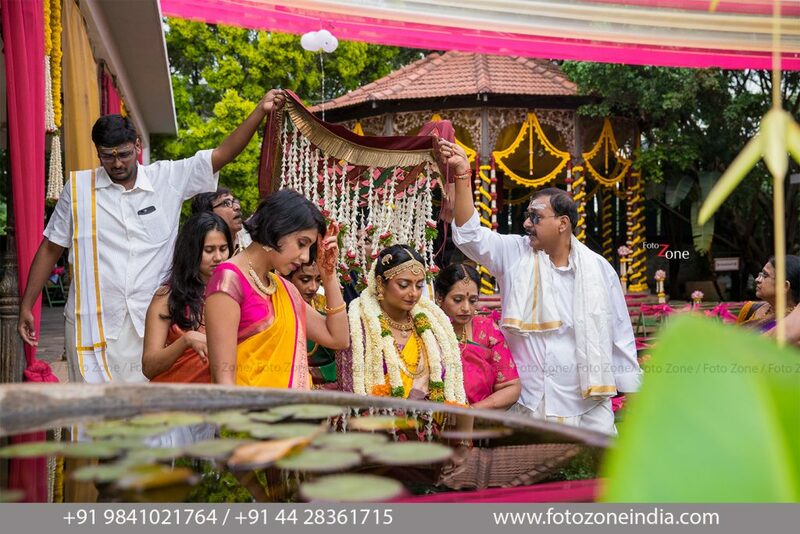 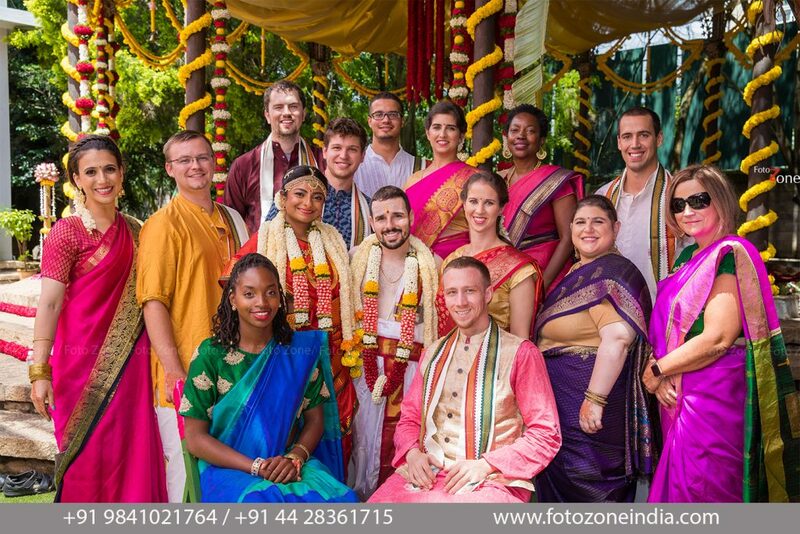 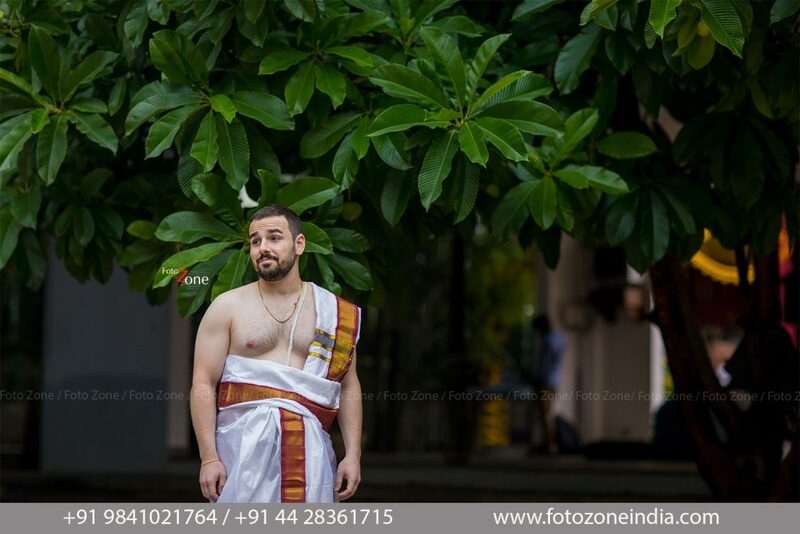 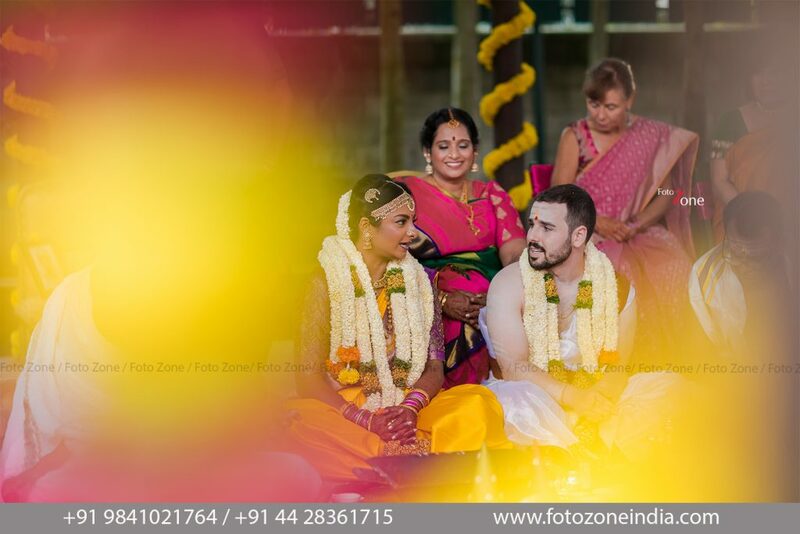 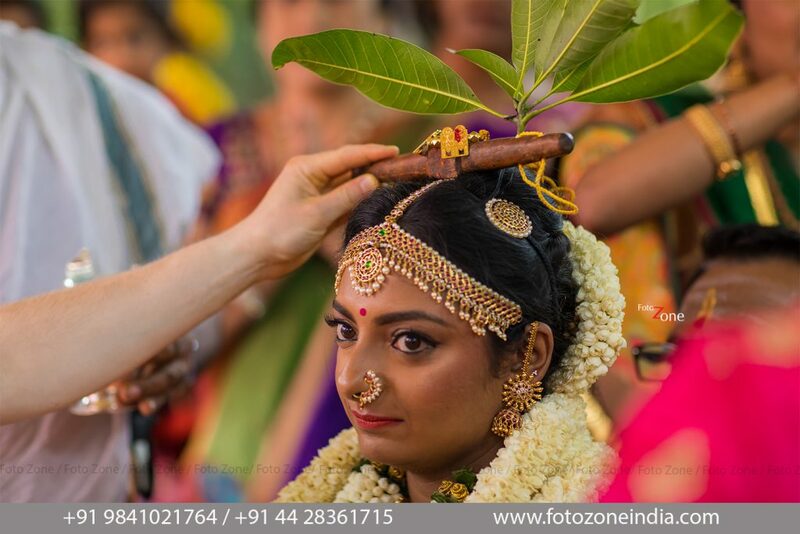 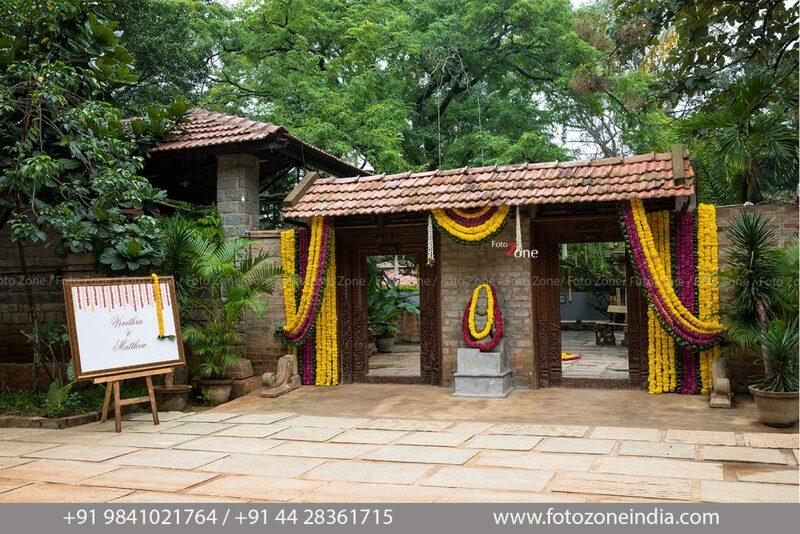 Set in the ever-pleasant climate of Bengaluru, the Tamarind Tree proved to be an amazing wedding destination for this American-Indian Tamil Brahmin wedding. 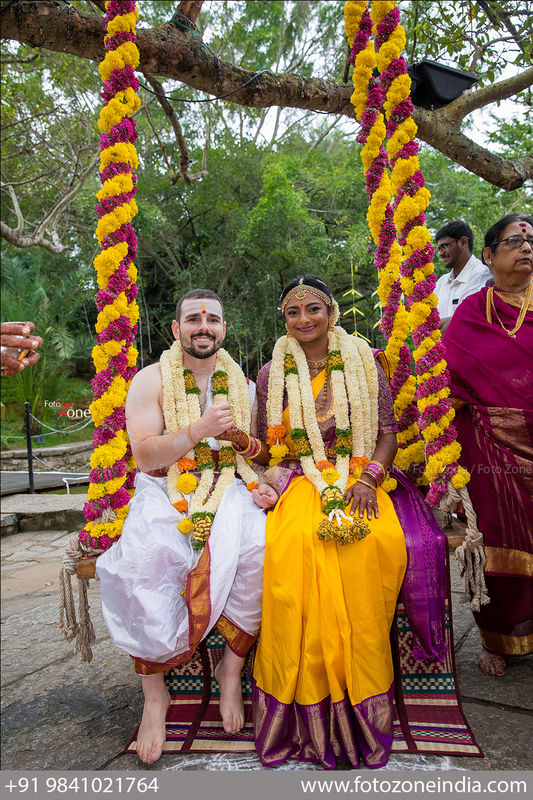 Vinithra and Matthew had their closest relatives in attendance. 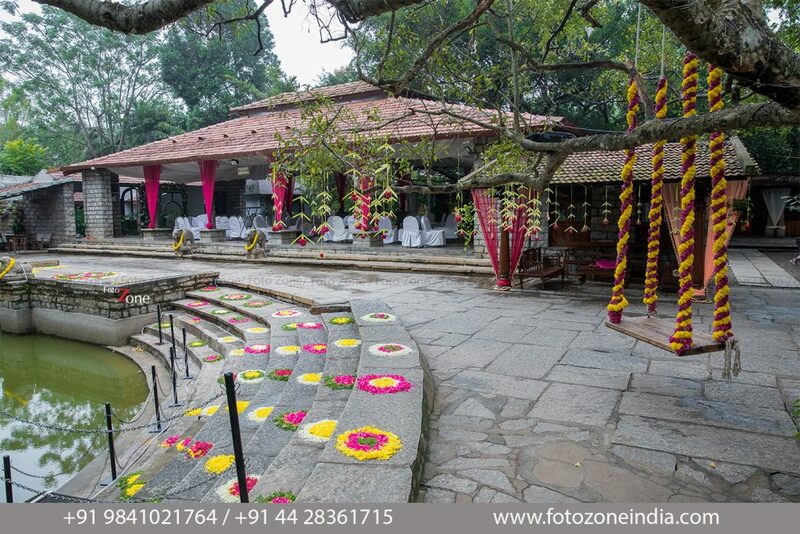 There was much laughter, tastefully done decoration and natural scenery to compliment the intimate setting of the wedding. 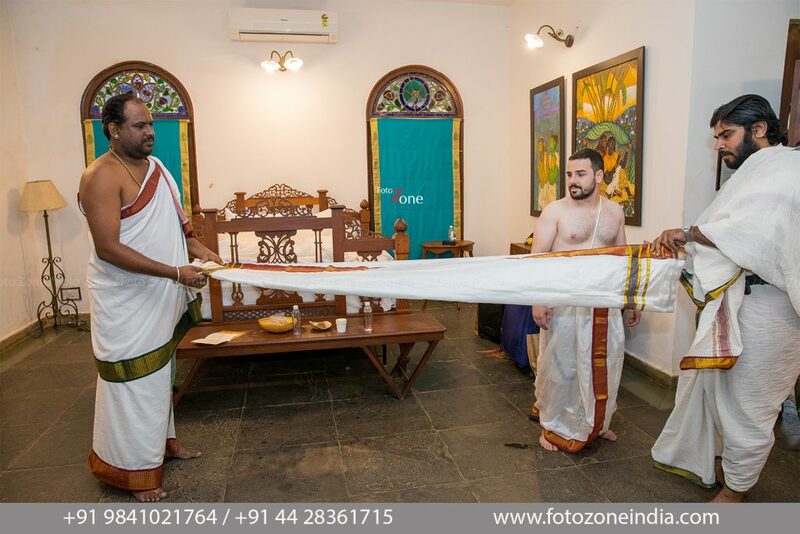 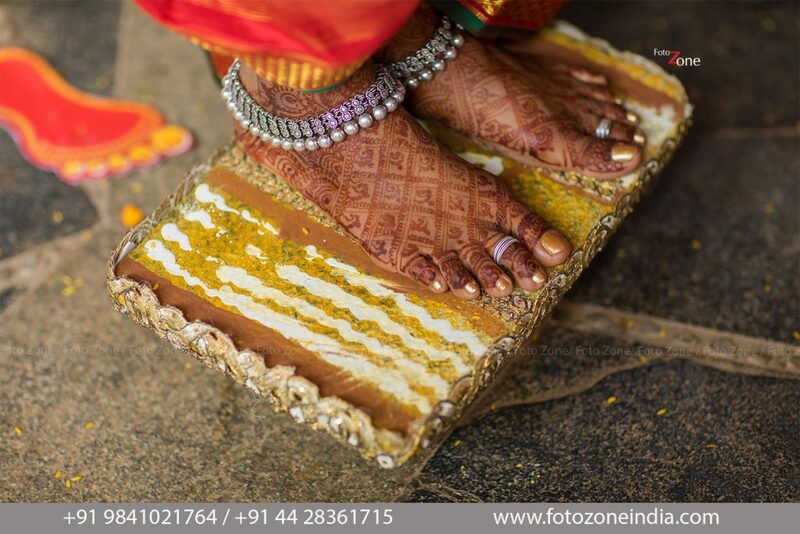 We at Foto Zone, had a huge task in hand because it is not every day that we get to shoot such a unique coming together of two eclectic cultures. 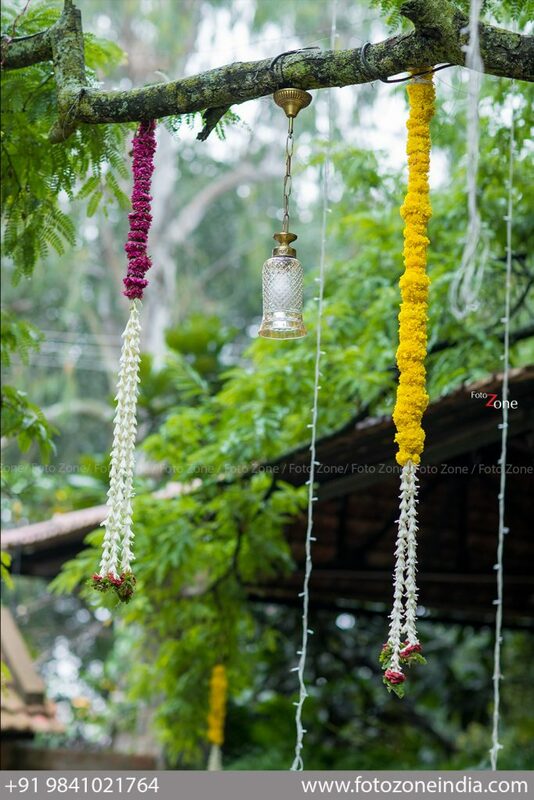 We started our journey by capturing the intricate settings at the venue, the floral arrangements and the quirky lighting designs. 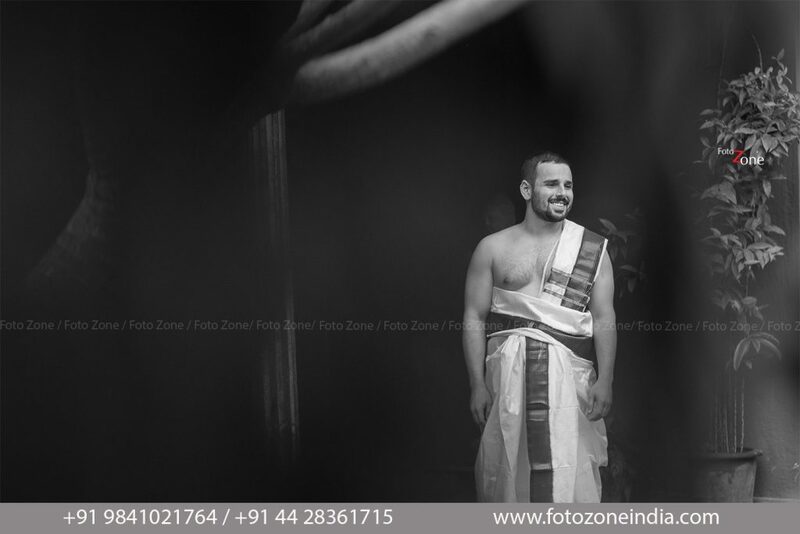 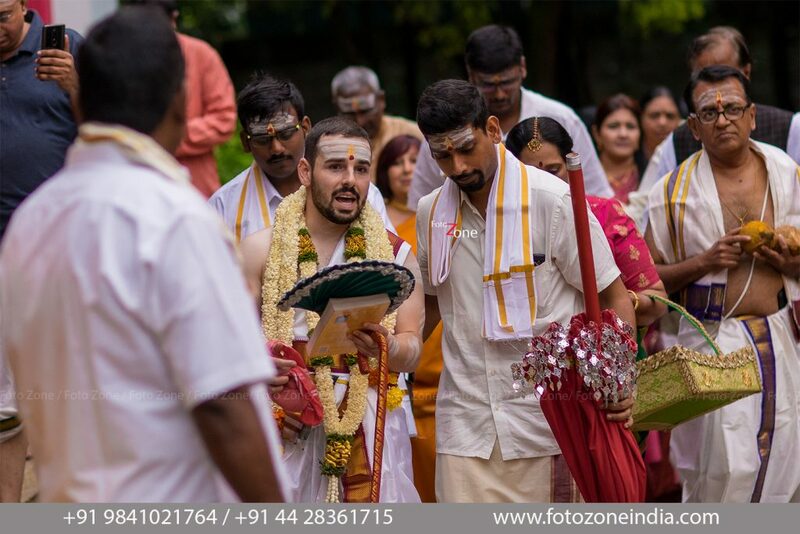 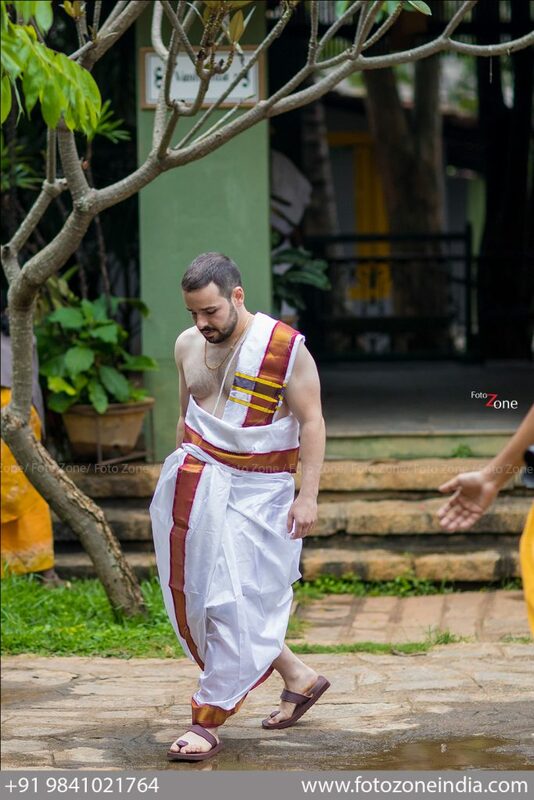 While we were at it, we spied the groom with the priests and saw his decked up for his Kasi Yatra, the ceremony where the groom sets out to Varanasi (figuratively!) 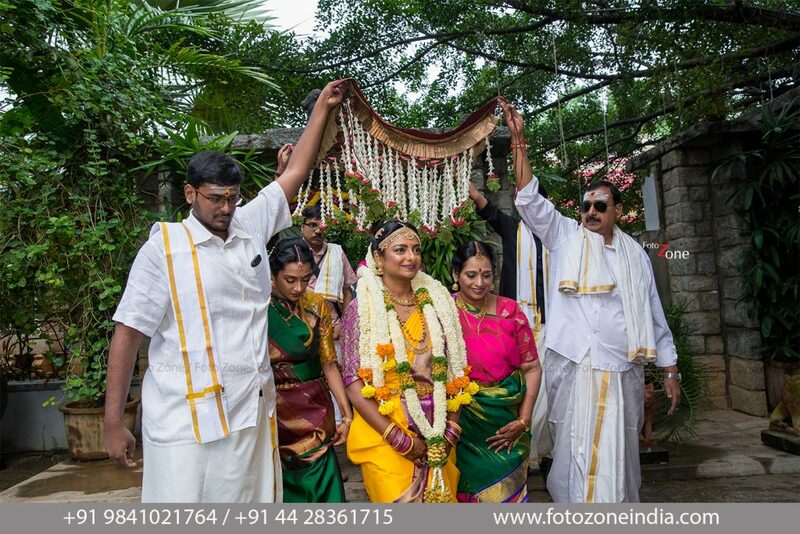 and the bride’s father intercepts him and promises his daughter’s hand in marriage. 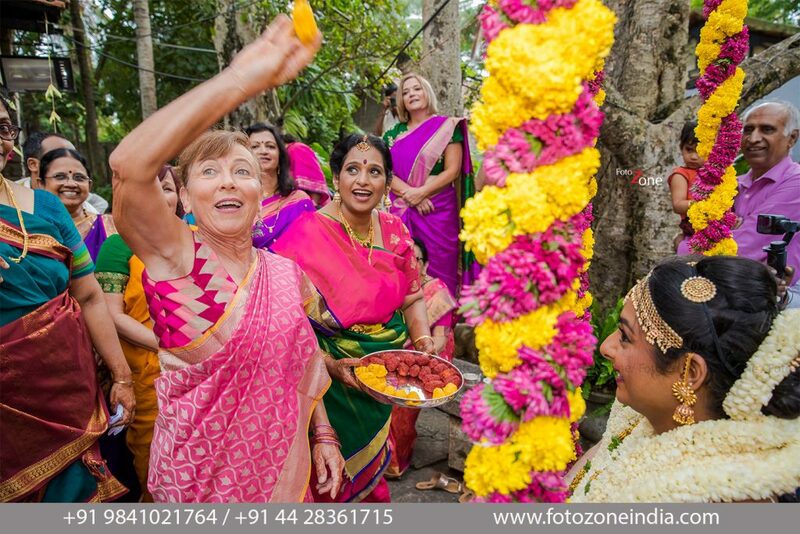 This was followed by the colourful Oonjal (swing) ceremony where Matthew’s relatives had fun, rotating the rice balls around the bride and groom. 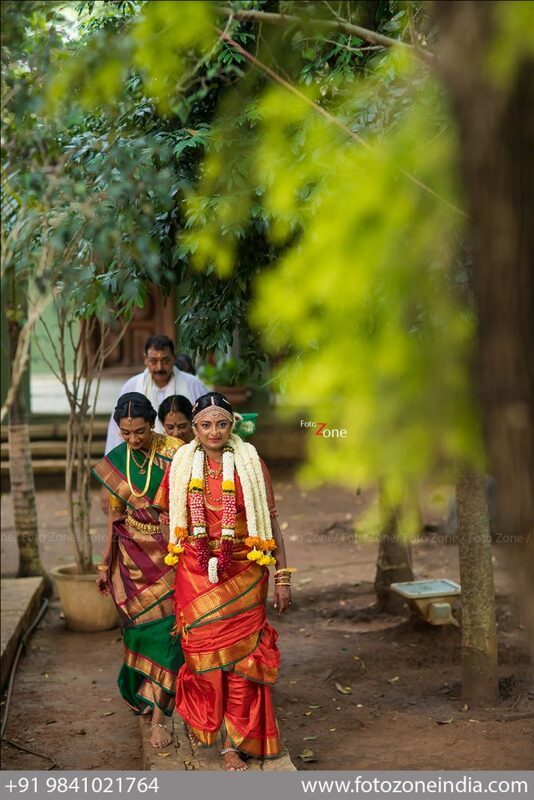 After this we followed the wedding party into the hall, where the official rituals began. 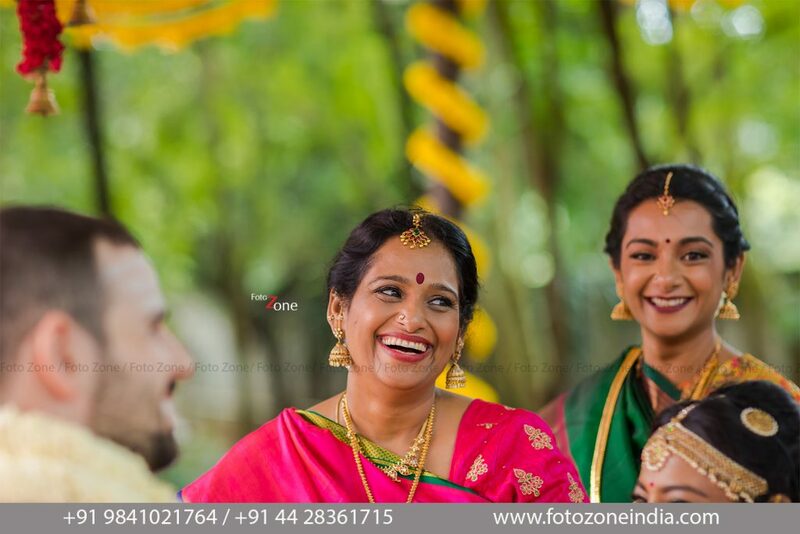 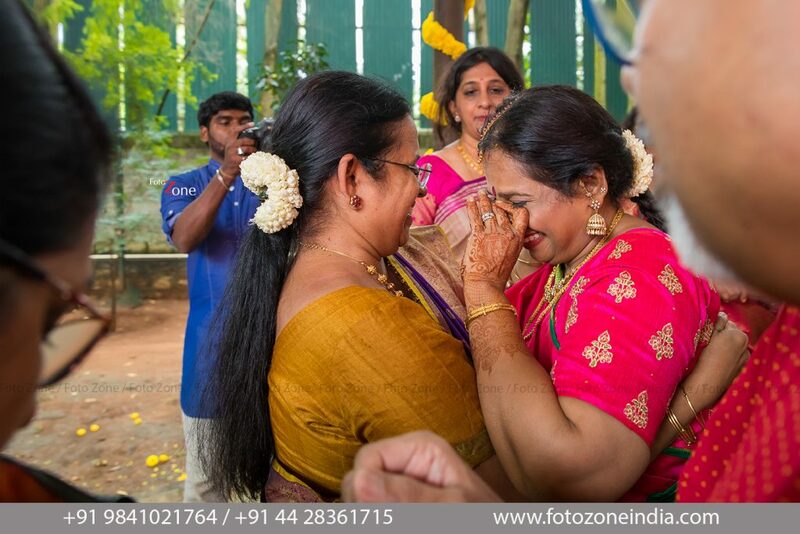 This was the perfect time to capture some candid shots of the couple and their families and rightly so, we could get some amazing shots of the mother and sister of the bride in their happy element! 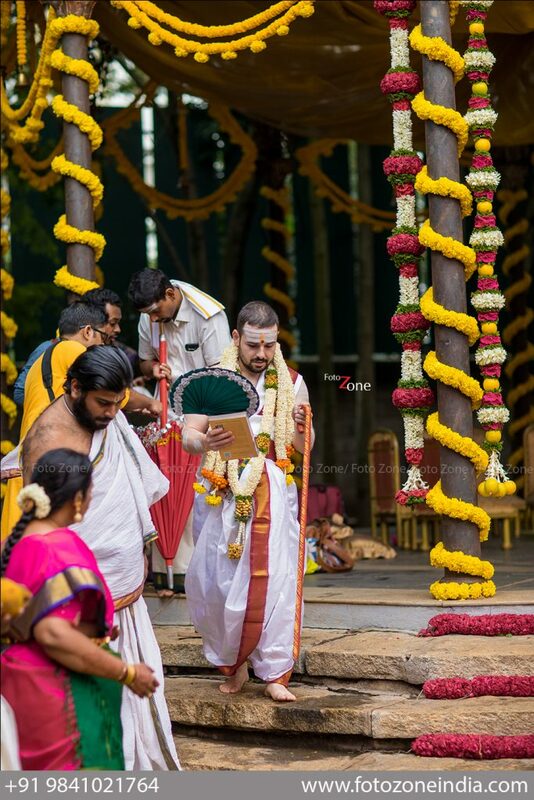 All this led to the moment where Vinithra entered the hall in her bridal madisar attire which really had everyone hooked to her heavenly sight. 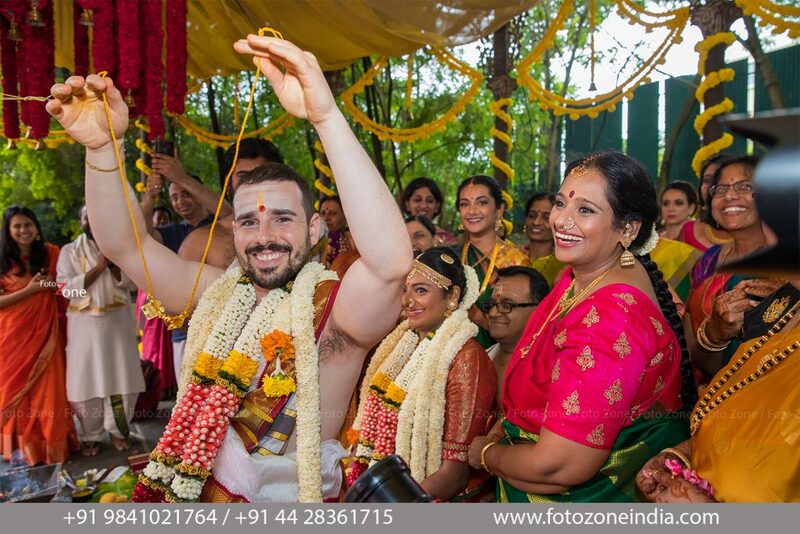 It was an emotional moment for everyone present, to witness the knot-tying ceremony. 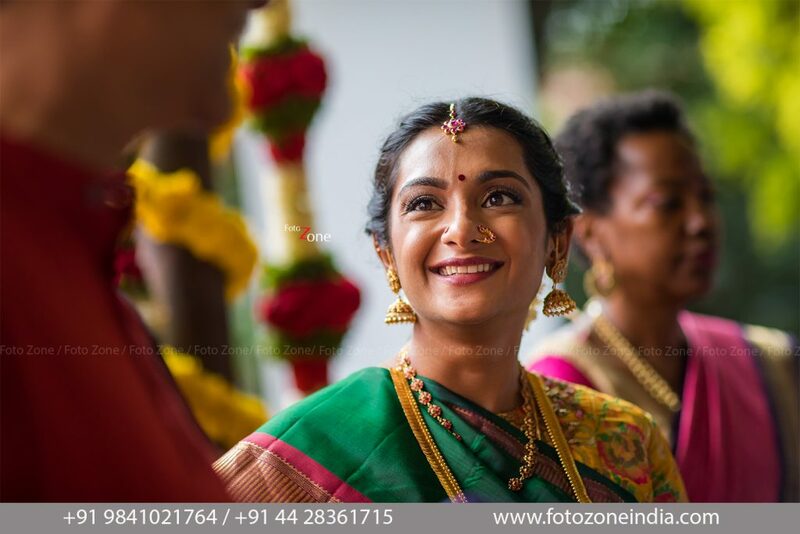 Matthew and Vinithra were together, in the following rituals of placing the toe rings and spotting the Arundhati star in the clear sky. 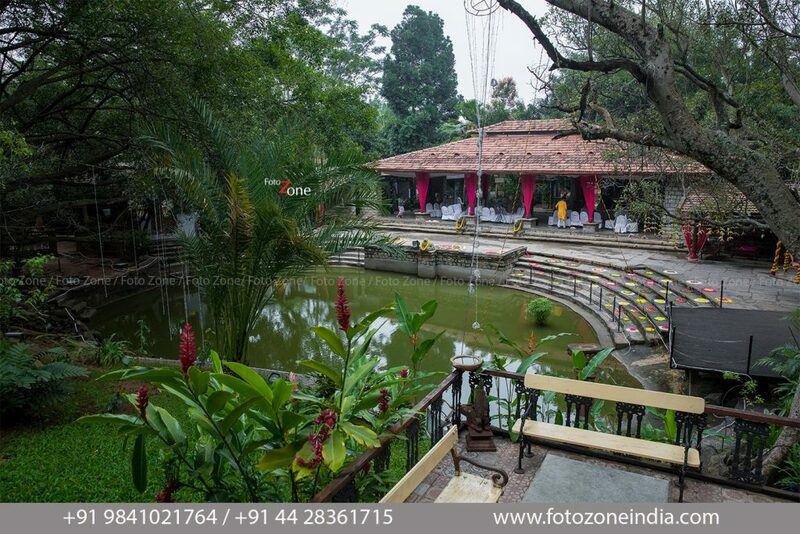 This was followed by group pictures with Matthew’s family and ended with the couple’s post-wedding shoot in the scenic backgrounds that the venue offered. 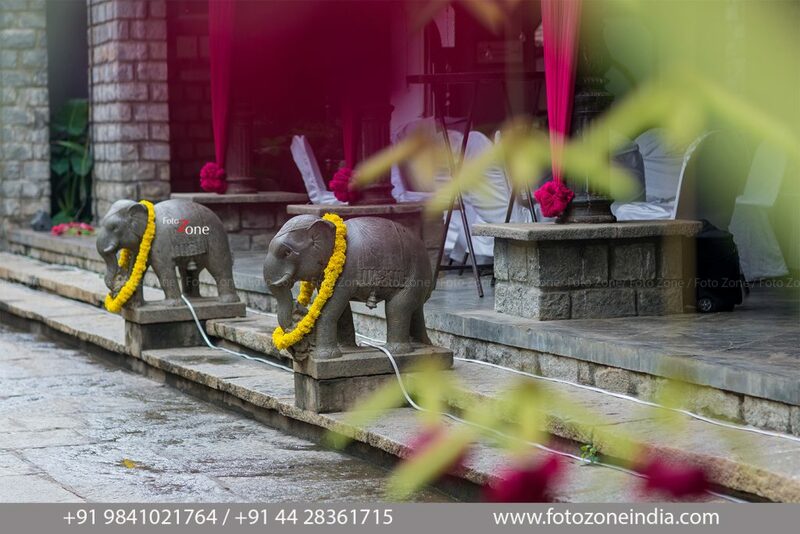 Every wedding stands out in its own way and this was very special because we understood the importance of a good venue, the complimenting decoration and most importantly, the understanding between two families. 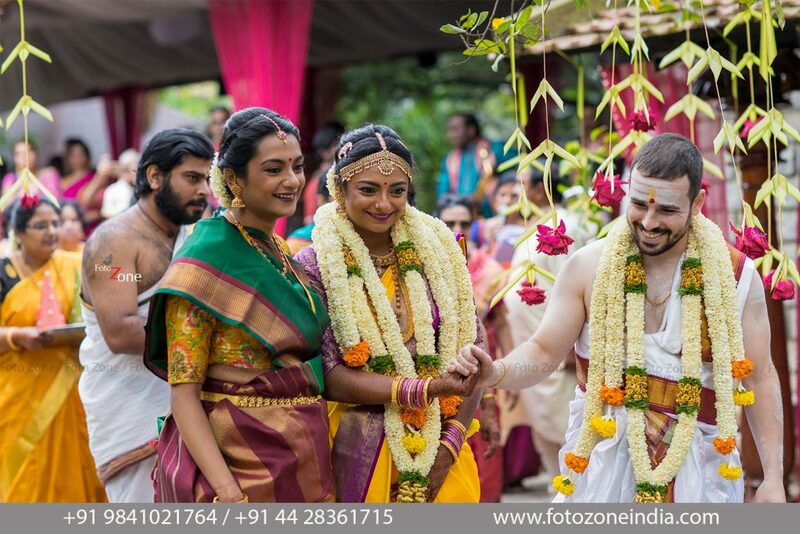 Quoting as a true blue Indian, it is a marriage of two families and not just two people. 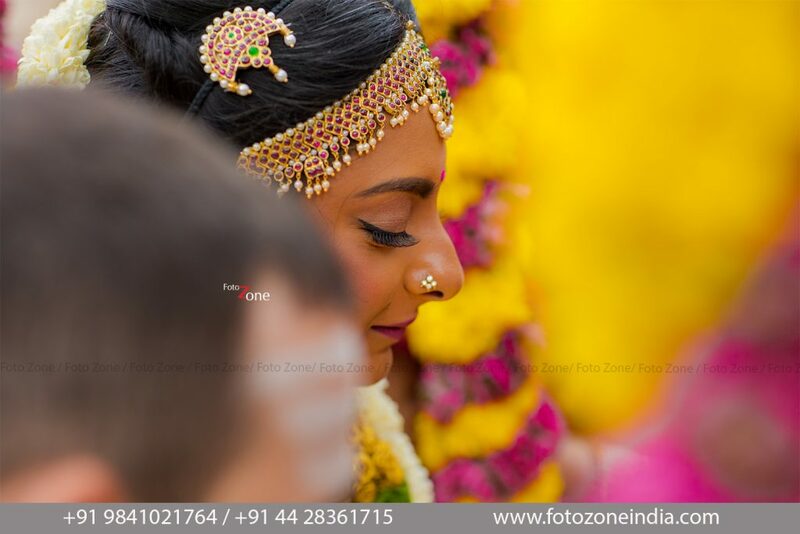 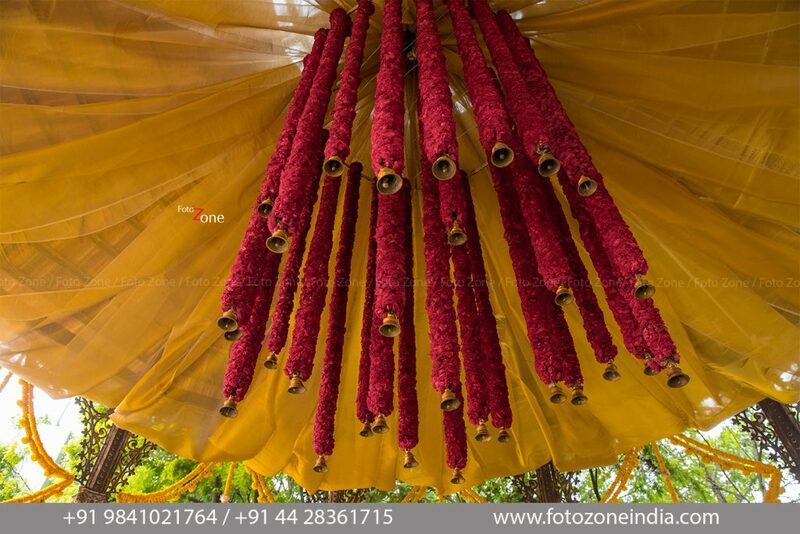 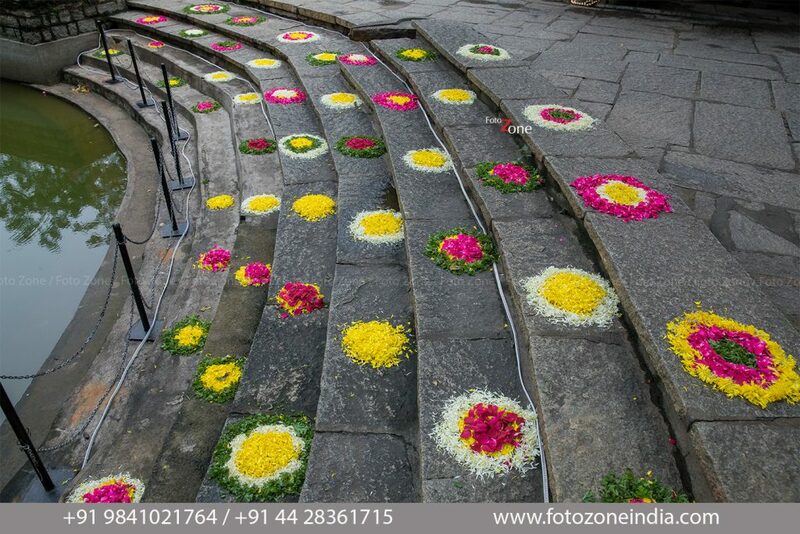 Indian wedding photography always fascinates us for this fact and we, over the years have been lucky to capture some candid wedding moments and this has made us one of the reputed wedding photographers in India. 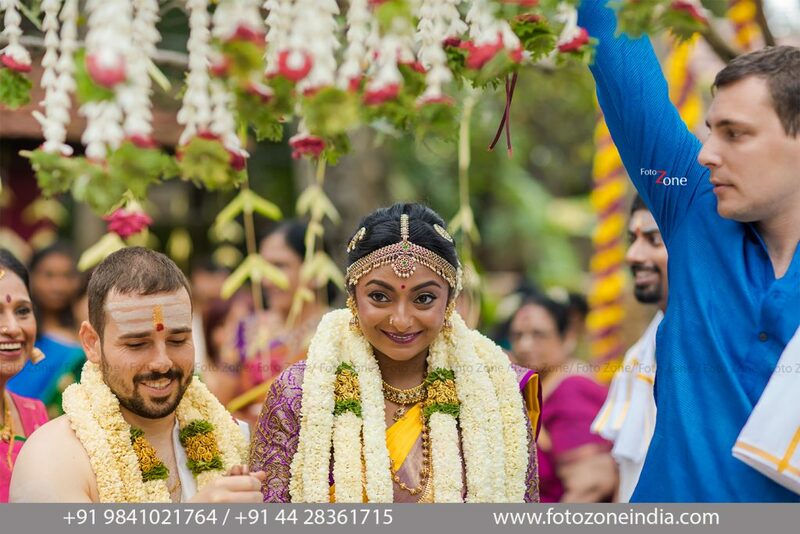 We look forward to being a part of many such moments in the future and we shall always celebrate happiness in the truest form.